At the cusp of rapid innovation, the automotive industry is transitioning into a phase where OEMs are becoming highly focused towards increasing the efficiency of vehicles across parameters such as cost-effective production, optimized raw material usage, minimalist designs, fuel consumption, occupant safety, and integration of smart technologies. The demand for automotive seals, particularly for exterior applications, continues to gain traction in the view of brimming sales of commercial vehicles and SUVs across the globe. According to Transparency Market Research’s new report, leading manufacturers of automotive window & exterior seals are actively focusing on adopting efficient production techniques to cater to the surging demand. Companies namely, Cooper-Standard Automotive Inc., Hutchinson Sealing Systems, Henniges Automotive Holdings Inc., Magna International Inc., Lauren Plastics LLC, PPAP Automotive, Minth Group Ltd., Toyoda Gosei Co., Ltd., Rehau Automotive S.R.O, Saar Gummi Group, and Standard Profil are being recognized in the report as the leaders in the global production of automotive window & exterior seals. These players are expected to instrument the growth of the global automotive window & exterior sealing market over the foreseeable future. The report projects that majority of automotive window & exterior seals will be produced and sold in the Asia-Pacific excluding Japan (APEJ) region. The report projects that the demand for seals in the APEJ automotive industry will remain exceptionally high due to the leading contribution of China, South Korea, and India in the global production of automobiles. By the end of 2026, the APEJ automotive window & exterior sealing is expected to be worth nearly US$ 6.8 Bn. Europe and North America are also expected to be at the forefront of global automotive window & exterior sealing market expansion. Based on the type of components being sealed, the report estimates that glass run channels of automotive windows will account for highest sales of automotive window & exterior seals through 2026. 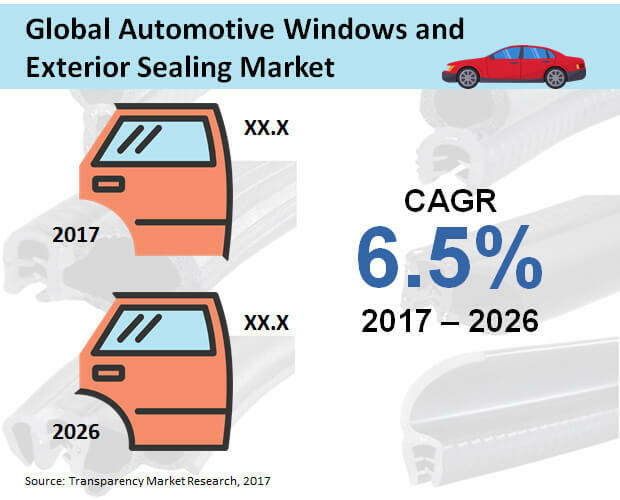 The pivotal role of sealing the glass run channels and increasing driver safety, coupled with the advantage of maintaining interior vehicle temperature, is expected to boost their presence in the growth of the global automotive window & exterior sealing market. In 2017, automotive window & exterior seals worth US$ 2 Bn were sold for sealing glass run channels of vehicles across the globe. The report further reveals that aftermarket will be the largest sales channel in the global automotive window & exterior sealing market through 2026. Over the forecast period, almost every other automotive window & exterior seal being produced in the global market will be sold through automotive aftermarkets. Likewise, passenger cars will represent the leading vehicle-type segment in the global automotive window & exterior sealing market, accounting for nearly three-fourth share on global revenues through 2026.